What do Pflugerville, Texas; Avon, Colo.; and West Grove, Pa. have in common? How about Irvine, Calif.; Belleville, N.J.; Hamilton, Ohio; and Naples, Fla.? Denver and Dallas? Best New Medical Office Building (MOB) or Other Outpatient Facility (Less than 25,000 square feet): Five Star ER Pflugerville, Pflugerville, Texas. Developer: Lockard. Best New MOB or Other Outpatient Facility (25,000 to 49,999 square feet): Buck Creek Medical Plaza, Avon, Colo. Developer: NexCore Group LLC. Best New MOB or Other Outpatient Facility (50,000 to 99,999 square feet): Penn Medicine Southern Chester County, West Grove, Pa. Developer: Anchor Health Properties. Best New MOB or Other Outpatient Facility (100,000 square feet or more): Hoag Health Center Irvine-Sand Canyon, Irvine, Calif. Developer: PMB. Best Renovated or Repurposed Healthcare Facility: Clara Maass Medical Center MOBs, Belleville, N.J. Developer: Rendina Healthcare Real Estate. Best New Hospital or Other Inpatient Facility: TriHealth Bethesda Butler Hospital, Hamilton, Ohio. Developer: Duke Realty. Best New Post-Acute or Senior Living Facility: Beach House Assisted Living and Memory Care, Naples, Fla. Developer: Prevarian Companies LP. Healthcare Real Estate Executive of the Year: Jason Signor, Caddis. Lifetime Achievement Award: Tim Oliver, NexCore Group LLC. 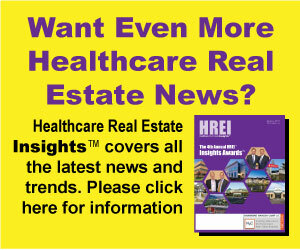 “The HREI Insights Awards™ program just keeps on growing,” Editor John B. Mugford says. “Once again, we beat the previous record from the year before for the most entries. Please watch HREI™ for details, which will be released this summer.